Font Wrangler is the TrueType / OpenType font manager that makes it easy to batch install, remove, change their name and copy fonts. You can quickly browse and weed installed and downloaded fonts, print a contact sheet, and resolve typeface name conflicts. When you install new fonts you soon discover that keeping track of them is a time-consuming endeavor. Remembering what all your fonts look like is worse still. Font Wrangler is the application to help you keep your fonts in line. Specifically, you can: install and remove TrueType fonts with a visual, intuitive user interface; browse downloaded fonts to decide which ones to keep; weed your font collection to rename or delete selected files; print a 'contact sheet' of fonts so you'll have a paper reference of what each font looks like and change your font names to make them more easily remembered and to resolve typeface name conflicts. If you have more than a handful of fonts - and especially if you like to collect new fonts - you'll find Font Wrangler to be a useful addition. 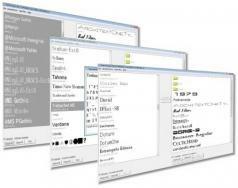 - Install and remove TrueType fonts with a visual, intuitive user interface. - Browse downloaded fonts so you can decide which ones you'd like to keep. - Weed your downloaded font collection to rename or delete selected files. - Print a "contact sheet" of fonts so you'll have a paper reference of your downloaded and installed fonts. - Change the font names of TrueType fonts to make them more easily remembered and to resolve typeface name conflicts.